Late Thursday night, we received a phone call from a man who lives on some acreage in the foothills above Pasadena, saying that he had just found what he said looked like a small desert tortoise, crossing the street! He said it was unlike tortoises he had seen before -- the octagons on the shell were smooth, not raised, and there was no 'horn' under the chin area. We went to have a look. We found what looked like a young (5-7-year old) female desert tortoise, apparently healthy, energetic, perhaps a bit small for the number of growth rings maybe malnourished. We built her a good-sized cardboard temporary enclosure and filled it with grass, dirt, fresh dandelion greens, and some other leafy greens we had available at the moment, then went on to contact several tortoise rescues to see about what to do with her next. We found the perfect forever home for our newly-named "Betty" in Kernville, northeast of Bakersfeld. 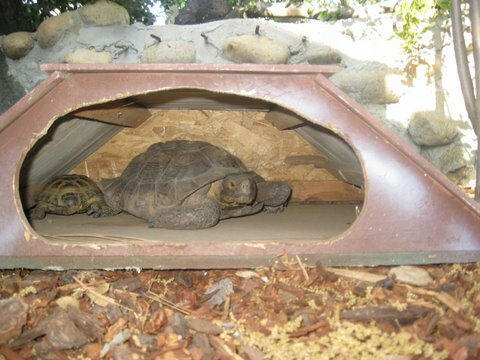 This family was licensed to have desert tortoises and had a beautiful, large custom-built stone and wood enclosure, which currently house one 40-year-old female desert tortoise named "Biddy." (Honest! We thought about renaming Betty "Iddy", but refrained.) But now for the real coincidence. Biddy had just recently lost her companion of the past 20 years and had been behaving as if she were lonely. Sounded made-to-order to us! We flew Betty up there the next day, and put her in the enclosure with Biddy. Betty inspected the whole enclosure and then made her way up to the 'house' where Biddy was resting, and the two have been inseparable ever since. For the rest of her life, Betty will be dining nutritiously on delicacies like prickly pear cactus and 'timothy hay', and her old favorite dandelion greens. So now Biddy has Betty, and Betty has Biddy, and the two ladies seem happy as can be with the situation!